Nashik has a long and tasty tradition of various delicacies which has been carried down by the generations. Many shops, famous for delicacies – usually their specialities – have now formed a brand image for Nashik outside the city. One of the foremost runners in such shops is 148 year old Pande Mithai. 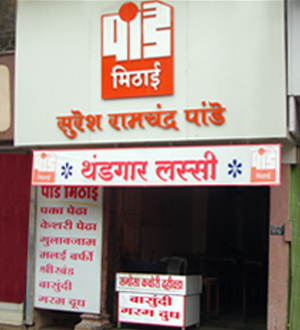 Established by Jagannath Shivlal Pande in 1864, Pande Mithai stands tall with traditional sweetshop look, selling all the traditional sweets including different types of pedhas, Gulab jamun, Shrikhand, Raghodas laddoos, Khurchand wadi (a special Nashik recipe), Malai burfi, basundi and lot more. You also find dairy products on the counter. Today, the fourth, fifth and sixth generation of Jagannath Pande are handling the family business successfully. Sharadchandra Pande aka Munnu chacha, one of the owners of Pande Mithai shares, “My great grandfather started this shop. My grandfather had three sons. He distributed business amongst them in 1971.” “I have two brothers and we run seven outlets of Pande Mithai,” he boasts. Out of these seven outlets, the oldest one is at Main Road, in front of Madhukar Talkies. It is indeed difficult to look after such a widespread business personally. Running a dairy or a sweetmeat shop is yet another herculean task, thanks to continuous adulteration in the raw materials like milk, sugar, flavours, etc. So how do the Pandes’ manage to keep the quality? Answers Munnu chacha, “We have fixed suppliers. Many of our suppliers are Konkani Muslims who are into the dairy business for a long time. In fact, their four generations have been dealing with us. They are more like a family now. In fact, one of my suppliers is my childhood friend and we went to school together. This is what our bonding with suppliers is.” Also, to keep the quality of the food integral, they have made it an unwritten rule of preparing all the food products daily. Ask the older Nashik and they will be full of stories of how the Pande mithai shop would be crowded with people, especially the wrestlers for enjoying the milk and Gulab jamuns at any time of the day. You can take a rickshaw to Main Road. Ask for Madhukar Talkies or Old Nashik Municipal Corporation building. 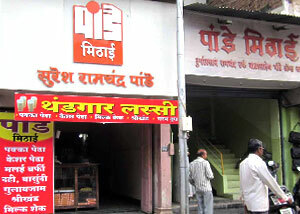 Pande Mithai is exactly in front of Madhukar talkies or walk few steps from Old Nashik Municipal Corporation building towards Gadge Maharaj statue. What to eat at Pande Mithai? Opt for milk, masala milk and their very famous Gulab Jamuns. The size of Gulab Jamuns is sure to make your eyes pop out. The Gulab Jamuns are BIG!